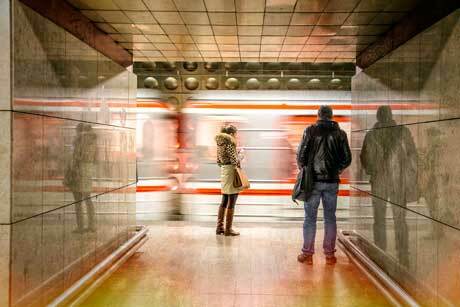 Prague Subway, photograph by Lillis Werder. Lillis Werder continuously searches for the light in her images in order to capture the changing tones of the day or to illuminate her subjects in intriguing ways. She travels to romantic and rustic destinations with a goal to encourage others to travel and uncover the details which often go unnoticed in our rapid-fire world. Europe is her favorite destination, and in particular, Italy, although she has found majestic historic icons, and rich, ideological and political history in her own surroundings of Washington, DC. Lillis hopes her images will transport others to these destinations as she breathes new life into everyday scenes. There is both unimaginable beauty in her images as well as stark reality. She uses modern software techniques to convey a painterly feel to many of her images and digitally enhances each in a unique way. Her work is printed on museum quality canvases or on the finest papers to create stunning, long-lasting pieces of art. She is a graduate of Georgetown University’s School of Foreign Service which instilled within her a love of travel and creativity. A native of Fort Scott, Kansas, Lillis Werder attended Georgetown University in Washington, DC graduating from the Edmund A. Walsh School of Foreign Service and majoring in International Politics, with a fluency in the Spanish language. Since college, Lillis has remained in DC working in the stock brokerage, foreign exchange, and IT fields. After a long career at IBM, she went on to fulfill her creative goal and studied to become a photographer. Today she heads her own business, Lillis Photography, and she exhibits her work in several art galleries and juried art shows in the DC and Richmond areas. Lillis Photography serves the Washington, DC metropolitan area, providing portraits for families, businesses, high school seniors, horses and riders, website products, food, gala dinners, and parties of all kinds. Lillis sells her fine art photography to the hospitality and healthcare industries, corporate, residential clients, and used by interior designers. She also sells to large retailers such as Restoration Hardware. A photographer for American Friends of the Czech Republic (AFoCR), a nonprofit organization which promotes relations between the two countries, Lillis covers events and ceremonies. She travels frequently to Europe and other foreign locations for images which are sold worldwide to newspapers, magazines, books, catalogs, calendar and post card companies and to web sites. Lillis also photographs home interiors for various Virginia realtors, including TTR Sotheby's. Her artwork may be found at the Art League in Alexandria, through public exhibits with the F11 Women's Photography Collective, historic homes, and specialty shops. Her images have been featured on many web sites and publications, including National Geographic, RedBook Magazine, and the Washington Post. She has self-published over 20 photography books and has sold art to large retailers for web and catalog sales. The exhibit hours are 7 a.m.-9 p.m., 7 days a week. Please contact building security to ensure access at (571) 553-3511 or (202) 815-9741. For more information please contact the Office of Corporate and Community Relations by email or by calling (571) 553-5002.